We are engaged in offering Zig Zag Paver Mould to our Clients. 288 pieces required for 100 SqFt. Established in the year 2009, We are busy in manufacturing the top quality PVC and Tile mould for precast concrete products. We take great pleasure to introduce ourselves as a fast growing PVC mould manufacturing company. We are engaged in I Shape Paver Mould, Chequered Tile Mould, Square Cover Block Paver Mould, Round Cover Block Paver Mould, Brick Paver Mould, Cosmic Paver Mould, Kerbstone Mould, Kerbstone Paver Mould. Earlier known as M.G. Industries we have been manufacturing top quality PVC mould for precast concrete products. Our CEO comes with more than 25 years experience behind him in the PVC industry. Presently our line of business is the manufacturing of paver moulds. PVC Moulds are manufactured at our state of the art infrastructure with the latest technology equipment. The raw material used comprises of premium quality stabilisers to achieve greater stability, premium quality lubricants and antioxidants for endurance and longevity, superior quality rubber to enhance flexibility that would last until the end of life of the product. 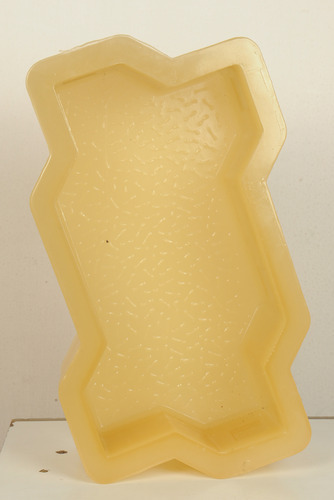 This mixture of raw material gives our mould a yellow colour.